A panel discussion with some of the LA artists featured in the retrospective exhibition SYNAPSE at the Los Angeles Center for Digital Art. As part of the Digilantes, these artists talk about their work and the development of the organization that mounted computer art exhibitions throughout Southern California in the 1990's. Artists Michael Wright, Victor Acevedo and Michael Masucci are interviewed by Daniel Durning from the Exhibition Hall at the LA Convention Center on August 3rd, 2005, during ACM/SIGGRAPH 2005, the 32nd International Conference on Computer Graphics and Interactive Techniques. 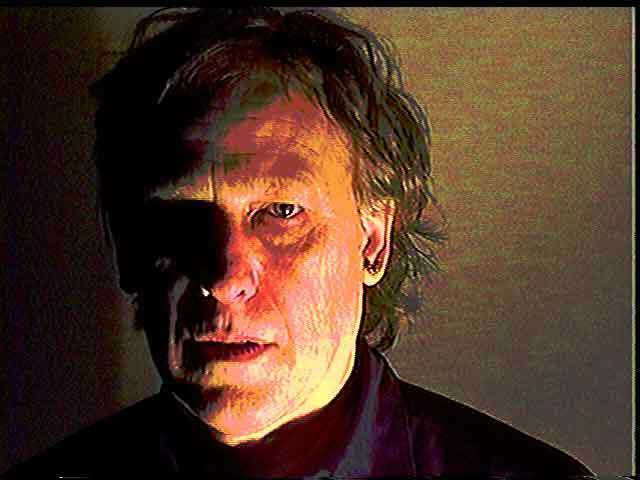 Michael Wright is a painter who began to explore Digital Media in the mid 1980's, exhibited his first Digital Prints in 1989, and continues to work in both traditional and electronic mediums. Wright is featured in Going Digital: The Practice and Vision of Digital Artists by Joseph Nalven and JD. Jarvis. Victor Acevedo is an artist best known for his digital work involving printmaking and photography. He has shown his work in over 80 exhibitions worldwide. He is based in New York where he teaches at the School of Visual Arts in the MFA Computer Art program. Michael Masucci is an award-winning video, stage and multimedia producer, director and artist. Throughout his full-time career as an artist, Masucci has also curated and produced hundreds of exhibitions, live performance events, lectures and film and video screenings. He is the Artistic Director of EZTV, Los Angeles' 26 year-old Media Art institution.